1001 STIEFF REPOUSSE STERLING FLATWARE SET: Approx 87 pieces in a floral repousse pattern by Stieff to include 3 forks (7 1/4''), 9 forks (6 7/8''), 12 salad forks (6''), 12 cocktail forks (5 5/8''), 11 teaspoons (6''), 12 5 O'Clock teaspoons (7 1/2''), 12 hollow knives (10 with bolster, 2 without, 9''), 12 hollow butter knives (5 3/4''), tablespoon (7 3/4''), 2 serving spoons (8''), sugar scoop (6''). Sold with wood silver chest, 4 3/4'' h. x 19'' x 13''. Approx 88.8 troy oz. 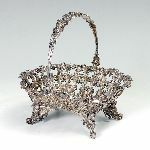 1003 AUSTRO-HUNGARIAN PIERCED SILVER BASKET VIENNA 1846: Delicately embossed floral motif basket with masquerons to handle, applied grape accent piece to center and winged griffin feet. Marks indicate Vienna 1846, 13/16 loth (silver content .813), and maker mark of AR, marks possibly added at a later date. Approx. 10 1/4'' x 8 3/4'', basket 4''h., 10''h. to top of handle. Approx. 14 troy oz. 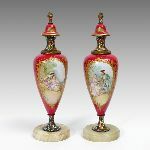 1006 HAND PAINTED SEVRES FRENCH PORCELAIN LAMP: Cobalt ground with gilt decoration, hand painted medallions with genre scene of lovers signed Lebel, landscape verso. Figural rams head handles, with metal mounts, on 4 feet. Marked with blue underglaze Sevres mark with letter F on bottom porcelain piece. Overall 24'' h. without harp x 8 1/2''. Sold with cloth shade, 15 1/2'' x 20 1/4''. 1007 3 PIECE HAND CHASED STERLING TEA SERVICE: 3 pieces total with unknown American makers mark, hand chased foliate motifs to include 1) Teapot with hinged lid, 9'' h. x 10''. 2) Open sugar 4'' h. x 6 3/4''. 3) Covered waste bowl, 6'' h. x 4 1/4''. Approx. 48.7 troy oz. 1008 GORHAM FAIRFAX STERLING COFFEE SERVICE & TRAY: 5 pieces total, 3 in the Fairfax pattern by Gorham to include coffee pot (7 1/4'' h. x 8''), open creamer (3 1/4'' x 5 3/4''), open sugar (3 1/4'' x 6''). Sold with Gorham Chippendale Reproduction tray, retailed by Black, Starr and Frost (19 3/4'' x 10 1/4''), and Tiffany & Co. sugar tongs. All pieces monogrammed, approx. 60 troy oz. 1011 1956 SIGNED ELVIS TOUR PROGRAM: Early Elvis Presley signature circa 1956, signed in Tampa, Florida on a rare Souvenir Picture Album for the 1956 tour touting Elvis as country music's ''Mr. Rhythm'', believed to be Elvis's first appearance as the cover of a program. Signed on the back cover in bold ball point pen. Signed inside by Justin Tubb, and the Louvin Brothers. Overall measures 10 3/4'' x 8 1/2''. 1012 OSCAR BACH QUALITY AESTHETIC MOVEMENT TABLE: Cast and wrought metal paint decorated base with nautical motifs to include sea shells and figural dolphin, on 8 legs with bun feet. Stamped inside Crest 152. Octagonal variegated marble top. Measures 22 3/4'' h. x 25''. 1013 GREGOIRE, Jean-Louis (French, 1840-1890): Partially Clad Beauty Catching Butterflies, Bronze, incised signature to base, approx. 28'' x 10''. 1014 DAILLION, Horace, (French, 1854-1937): Louis Pasteur Bronze, affixed to marble base, flanked by ink wells and pen tray. The Bronze measures 6 1/4'' h. x 6 1/2'' w., the base which contains the ink well and pen tray is approximately 9 1/2'' h. x 11 1/2'' w. and 5 1/2'' d., signed on the side of the Bronze. 1017 HEIRLOOM ''SENTIMENTAL'' STERLING FLATWARE: 42 piece service for 8 to include: 8 Forks (7 1/2''), 8 Salad forks (6 1/2''), 8 Teaspoons (6''), 10 Hollow Handle Knives (9''), 1 Hollow Handle Master Butter (6 3/8''), 1 Tablespoon (8 1/8''), 1 Meat Fork (8 1/4''), 1 Cream Ladle (6 1/4''), 2 Pierced Serving Spoons (8 1/8''), and 1 Olive Fork (5 1/4''). 48.1 Troy oz. 1017A RICHLY GRAINED CARVED MAHOGANY VANITY & MIRROR: Triptych mirror with carved frame, applied foliate swag to central mirror. Shaped base top and shaped central drawer with applied decoration, 2 drawers either side, fluted legs ending in castors. Overall measures 63 3/4'' h. x 52'' x 23 3/4''. 1018 ALLAN, Robert Weir, (British, 1852-1942): ''The Thames at Twickenham'', Oil/Canvas, 24'' x 42'', signed lower right, dated 1902, framed 28'' x 46 1/2''. 1019 19th C ENGLISH SCHOOL LANDSCAPE PAINTING: Oil/Canvas, 25 3/4'' x 36'', no visible signature, contemporary frame 31 1/2'' x 41''. 1021 JOLLY, Henri Jean Baptiste, (Belgian, 1812-1853): Henri Jean Baptiste & Two Ladies in a Drawing Room, Oil/Canvas, 25'' x 20 1/4'', elaborate leaf and berry motif gilded and carved period gesso frame 37'' x 32 1/2'' x 4'', signed lower left. 1022 ANTIQUE PHILIPPINES CARVED WOOD SANTOS: Polychrome and gilt decorated figure of a monk holding a bible with flowing robes. Old dealers label attached to back identifying as Filipino, 17th century, however we cannot confirm age. Measures 13 1/4'' h. x 7'' x 5''. 1023 ANTIQUE CARVED WOOD BABY JESUS FIGURE: Figure of the Christ Child with a pomegranate seated on paint decorated pillow with tassels. Old dealer or retailers tag on base with embossed BD and number 291. Overall measures 5 3/4'' h. x 4 1/4'' x 4''. 1024 ITALIAN GENRE PAINTING OF A BOY & MAN WITH MANDOLIN SIGNED A.P. FERRENI? : High Quality Oil/Canvas, Shows the Boy Singing while his Grandfather Plays the Mandolin, measures 15'' x 20 7/8'', signed lower right, framed 21 1/2'' x 27 1/8''. 1025 ANTIQUE POLYCHROME CARVED WOOD SANTOS: Figure of a monk with scroll in one hand, basket of fruit in the other, standing on a stepped pedestal. Actual age unknown. Measures 9 1/2'' h. x 4 1/2'' x 3''. 1026 MOLLICA, Emanuele, (Italian, 19th Century): ''La Zingarella'', Oil/Canvas, 18 1/2'' x 15'', signed and titled verso, painted gilded frame 23'' x 19 1/2''. 1026A THE MYSTIC MARRIAGE OF SAINT CATHERINE AFTER CORREGGIO: Painted by Mollica, Oil/Canvas, 18 1/2'' x 15'', signed and titled verso, encased in a very worn, painted, and gilded frame 23'' x 19 1/2''. 1026B OLD MASTER STYLE PAINTING BY MOLLICA JUDITH HOLDING HEAD OF HOLOFERNES: Old Master Style Painting Depicting Judith Holding the Head of Holofernes with Onlooker, Oil/Canvas, 18 1/2'' x 15'', After Correggio by Emanuele Mollica, gilded framed 23'' x 19 1/2''. 1028 R. J. HORNER INLAID HEADBOARD: Carved and shaped crest, marquetry inlaid torch and garland motif with mother of pearl flowers. Decorative hooks applied at some time. Head board only. Overall measures 70 1/2'' h. x 59'' x 7''. 1029 MARQUETRY INLAID 6 DRAWER CHEST: Shaped top, bow front, 6 graduating drawers with inlaid swags of garland, brass pulls, on 4 carved legs. Overall measures 53 1/2'' h. x 38'' x 21 1/4''. 1030 LOUIS XV STYLE FIGURAL ORMOLU PEDESTAL CLOCK: 20th Century production of an elaborate Louis XV style clock on stand. Wood case with applied gilt metal figures of cherubs in clouds signed Auguste Moreau, garland bow and floral decoration. Embossed gilt metal dial with Roman numerals in porcelain medallions, marked Made in Italy. German Franz Hermie time and strike movement. Pedestal base with door, decorated with gilt metal sun masqueron, urn, garland, paw feet and foliate mounts, parquetry inlaid panels. Overall measures 82'' x 19 1/2'' x 12''. For shipping purposes, case 27 1/2'' x 16 1/2'' x 10 1/4'' separates from base 55 1/4'' h. 19 1/2'' x 12''. 1032 SANT, James, (British, 1820-1916): Portrait Painting of a Young Girl, Oil/Canvas, 20'' x 16'', monogrammed upper left, framed 24 1/2'' x 20 5/8''. 1033 CARVED VICTORIAN SIDEBOARD: Stepped pediment with carved panel, back with shaped beveled mirror, carved and turned full column supports. Base with shaped front 4 central drawers with top 2 having carving, 2 side doors with carved panels. Overall measures 73 1/4'' x 54 1/4'' x 20 1/2''. 1035 MAHOGANY BOOKCASE: Double glass doors with fretwork, each side with 3 adjustable wood shelves. Turned column styles, measures 53 1/4'' h. x 51'' x 15''. 1036 HORLOR, Joseph, (United Kingdom, 1809-1887): Coastal Scene with Figures, Oil/Canvas, 9'' x 14'', signed lower left, encased in period carved and gilded gesso frame 11'' x 16 1/2''. 1037 MAHOGANY CHIPPENDALE STYLE BENCH SEAT: String inlay with carved acanthus leaves on the vertical slats, straight top rail, spade front feet. Contemporary chicken motif upholstered seat. Measures approx. 36 1/2'' tall x 40'' x 18''. 1038 PAIR LOUIS XV STYLE SHIELD BACK CHAIRS: Mahogany frames having carving on the crest rails, seat rails, arm rests, and knees of the front cabriole legs. Seat and back cushion are upholstered in a contemporary yellow silk fabric with medallions featuring chickens. Measure 37'' h. x 25 1/2'' x 27''. 1040 ROSEWOOD CARVED VICTORIAN SETTEE: Triple back with carved top rail with floral decoration, shaped supports, carved apron. Burgundy acanthus leaf motif upholstery with tufted center back. Measures 42 1/2'' h. x 68'' x 30''. 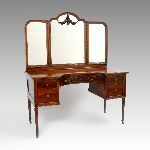 1040A BURL WOOD BUTLERS DESK: Top with bookmatch veneer trim, burl veneer front with carved stiles. Top drawer opens to writing surface, 4 internal drawers and cubby hole, over 3 full length drawers on legs. Overall measures 39 1/4'' h. x 42'' x 22 1/2''. 1042 GEORGE THE SUPREME MASTER OF MAGIC POSTER: Produced for the Grover G. George ill-fated 1924 Triumphant American Tour, which never occurred. Produced by the Otis Lithograph Co., featuring a portrait of George with owls, bats and devils in moonlight. Full title ''Triumphant American Tour, George the Supreme Master of Magic, 18 People, Carload of Scenic Effects''. Sight size 39 3/4'' x 25 3/4'', framed 43'' x 28 3/4''. 1044 ERTE, (French, 1892-1990): ''Starfish'', Serigraph, Sight size 34 1/2'' x 27 1/2'', pencil signed lower right, #'d lower left 42/300, exceptional framing and matting 46 1/2'' x 38 1/2''. 1045 ERTE, (French, 1892-1990): ''Grape Lady'', Serigraph, Sight size 34 1/2'' x 27'', pencil signed lower right, #'d lower left CXLII/CCL, exceptional custom framing 46 1/2'' x 38 1/2''. 1046 WHITE BLOWN GLASS RED TULIP CHANDELIER: Blown glass with white horns and bulbs, red tulip flowers. No visible maker tag or label, overall measures approx. 33''h. x 38''dia assembled, measurements not including hardware or wires as it is adjustable for your space. 1048 RIAB, Boris, (American-Russian Federation, 1898-1975): Portrait of a Setter with Grouse in his Mouth, Watercolor, Sight size 15'' x 11'', signed lower left, framed 21 1/2'' x 16 1/2''. 1049 RIAB, Boris, (American-Russian Federation, 1898-1975): Portrait of a German Setter with Duck in his Mouth, Watercolor, Sight size 15'' x 11'', signed lower left, framed 21 1/2'' x 16 1/2''.